Start with the undeniable certainty that Christophe Baron makes wines that offer flavors that occupy a distinct niche, with few (if any) comparables, even from the region he’s pioneered that is known as the Rocks. Yes, other vintners growing in the same cobble-laden soils get a semblance of the rich, umami-soaked minerality, but no one gets the same intensity across a broad spectrum of single vineyard wines, whether Bordeaux varieties, Grenache, Syrah, or Tempranillo. 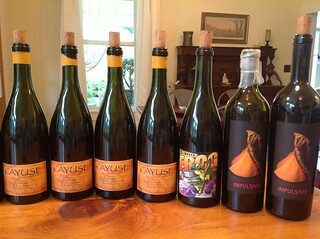 Then there is the Biodynamic aspect, which is practiced to a high degree at Cayuse. The method has its detractors, who find it easy to mock, but they have yet to explain why some of the finest vineyards in France, Italy and Spain have decided to focus on this expensive, time-consuming, labor-intensive practice. Personally, I totally believe, based entirely on having tasted hundreds of Biodynamic wines from all over the world, that there is a difference in flavor, texture, detail and persistence in such wines. It’s no sure-fire guarantee of superior quality, but it does play a significant part in that something extra that elevates certain domaines. But ultimately, what makes these wines so difficult to review is that they are transformational. They continually jump through flavor hoops. They are quarks in a molecular world. They embody the uncertainty principle of Planckian physics – as soon as you taste them, they’ve already moved on to something else. Overall the 2010 Cayuse wines seem to show more forward fruit, less intensely savory character, and somewhat more moderate alcohol levels than in past years. None of this is meant as a criticism. The wines are as fresh as ever, fascinating, complex, youthful and engaging. What more can you ask? Full reviews and scores will be published in a future issue of Wine Enthusiast. Here’s a quick preview of some of the highlights of a tasting that extended throughout a three-day period. This vintage marks a welcome return of a varietal Viognier to the otherwise all-red Cayuse portfolio. It’s an immaculate, elegant, complex wine, redolent of wet stone, dried herbs (thyme, rosemary), jicama, cucumber, lime, grapefruit, and more. On the second day, it had fleshed out considerably and was even better. "I cannot conceive a Grenache that you cannot see through,” Baron commented as we admired the deep rose color of the wine. Intensely fruity in the nose, with spicy flavors that follow and expand across the palate, it has excellent grip and depth, along with balancing acidity and structure. Half Cabernet Franc, 37% Merlot, and 13% Cabernet Sauvignon, this is one of a handful of Cayuse wines that spends a few months in new oak (about 50%). It’s done in a Claret style, firm, lightly toasty, with explosive dark fruits, streaked with umami, saline sea scents, dried plum, fig, cassis, earth and herb, all entwined, with compelling aromatics and impressive length. This was the surprise of the tasting; usually not among my very favorites, but in this vintage a wine I kept returning to again and again. This is 80% Cabernet Sauvignon, the rest Merlot, deep and rich, loaded with black cherry fruit, sporting a thick vein of black licorice and a finish laced with espresso and mineral. Tight, young and compact, it shows more earth than fruit; a classic, stylized Cayuse wine loaded with flavors of green tea and stem. Iron and smoke accents wrap around densely-layered fruits with excellent concentration. It’s a visit to the dark side of the Moon, gorgeous, deep and textured, the focus on a rich raspberry and cherry core inside the frame of umami, leaf and seaweed. Tightly-wound and dense with black and roasted fruits, smoke, carpaccio and cacao. Simply superb, the Armada Syrah offers outstanding length, depth and complexity. Aromatically explosive, this opens with floral and citrus – notably orange peel – then fills out with a lush palate bursting with cherry fruit, and the winery’s characteristic, savory, umami flavors. The finish seems to last indefinitely. The purity and potent, almost mystical aromas of the En Cerise Syrah conjure up flying carpet visions of purple and black fruits. The enticing aromatics have a citrusy lift, with orange peel and incense, like drinking a Persian rug. Amazingly complex, seamless, dense, and elegant, it’s a wine that never stops, as new flavors keep emerging the longer it breathes. Dark and meaty, with aromatic hints of mustard seed, this has a slight bitterness around the edges, which gives it focus and sharpness. A change in the barrel regimen now keeps it entirely in large format foudres and puncheons. It’s supple and lush, with mixed blue and black fruit, hints of citrus, and peppery umami notes.